Is your head this big? 3. 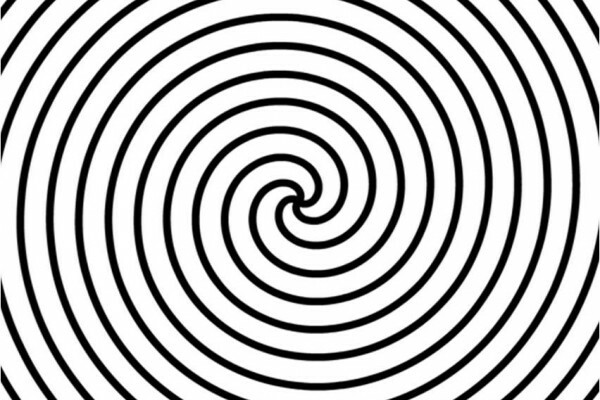 KEEP your focus on the centre of the spiral as it rotates for about 90 seconds. 4. When the video ends you should see something very peculiar! The face will appear to be growing outwards towards you. Don't worry, the face isn't actually doing this, and this strange effect will disappear soon - it's just a temporary visual illusion! The visual cortex, at the back of your brain. Being able to process information from your eyes is important; it allows you to form a picture of the world around you. This processing happens in the visual cortex, which is right at the back of your brain. Visual information enters through your eyes where the retina converts light into electrical signals. These are transmitted along the optic nerves to the visual cortex where they are decoded and a "picture" of what you are seeing is built and presented to your consciousness. In order to do this job correctly the visual cortex requires a lot of brain space. In fact, more than a third of the human brain is devoted to decoding what we look at, making it the largest single brain system. And different aspects, or types of visual information are analysed and processed by different parts of the brain. One brain area decodes colours, another processes faces, yet more decode shapes, and another assemblage processes motion. In fact we have different motion-detecting cells to detect movements from different directions. When no movement is being detected, all of the motion-processing cells are equally active but at a low level. This balanced activity means that you perceive everything as being still. But when you stared at the rotating spiral for a short period of time, the brain cells that were processing movement in that direction temporarily were forced to work much than cells that decode movements in other directions, which become relatively less active while this was happening. After staring at the centre of the rotating spiral, your inward-motion detecting cells become "fatigued". They adjust their activity to dampen their response. However, your outward detecting motion cells are still very active, so they give a much bigger signal than the tired inward detecting cells. This unbalances the signals, so you perceive my face as having an outward motion even though it really hasn't. So, by staring consistently at movement in a particular direction for even a short time, subsequently viewed stationary scenes appear to move in the opposite direction, leading to an illusion and change in perception. You can try this type of illusion again, the next time you are looking out from a car or train window. You can also have a go at the opposite direction rotating spiral, by watching the movie below. What do you think will happen to my face here? This type of illusion was first reported in detail by a Scottish rambler - a Mr. Robert Addams who, in 1834, decided to go out for an afternoons stroll in the highlands. Whilst out walking he stumbled upon a waterfall and was mesmerised by the downward cascade of water. After some enchanted minutes he managed to drag his eyes away from the waterfall. But when he looked away, the world appeared to be very different. His world had changed. His new world, and everything in it, now appeared to be moving upwards! Scientists have looked to see if other species are also affected by this motion after effect. For example, do flies get it? In 1978, two Australian neuroscientists, Srinivasan and Dvorak looked at blow flies - they usually live on sheep. They made the flies walk on a ping pong ball and monitored the electrical activity of the flies' brains as they turned the ball. Their results suggest that the flies are able to adapt to motion perception as well! How flies feel when they land on a stationary leaf or a sheep after having travelled at high speeds in the air must really be something to imagine! Neuroscientists are still intellectually stimulated by these visual illusions. They help us understand how brains process information and how we perceive the world. So, illusions are important tools to neuroscientists trying to understand perception. On the flipside, illusions are also important tools for understanding what happens when perception goes wrong, which is what happens with schizophrenia. People with schizophrenia experience delusions or hallucinations - they see and hear things that aren't necessarily real. This is a change in perception that can be incredibly scary for the person who experiences it. If neuroscientists can understand more about how we perceive the world around us, they will hopefully be able to use this understanding to improve the treatments for schizophrenia. Srinivasan, M.V., & Dvorak, D.R. (1979). The waterfall illusion in an insect visual system. Vision Research, 19, 1435-1437.